News & Events | Travis the Warrior --- Kickin' Cancer! Tyler’s Over the Edge Fundraiser! 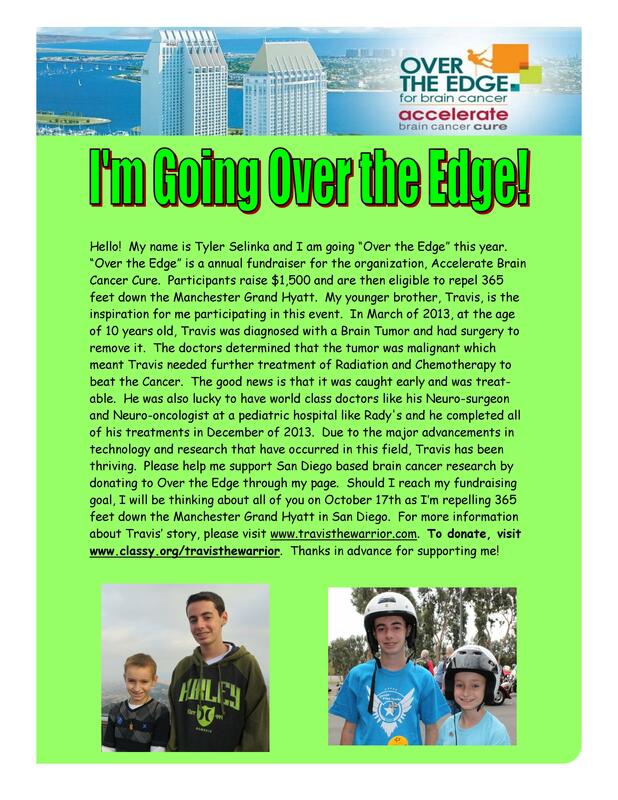 Click Here for Tyler’s Over the Edge Fundraising Page! Coach Jonno is part of our extended soccer family and he came to us some months ago asking Travis to pick a charity that he could raise some money for in Travis’ honor. With so many great organizations we have come across throughout our journey that was a very difficult decision to make. But, Travis kept coming back to Make-A-Wish for all of the incredible things they do for so many kids facing life-threatening challenges. 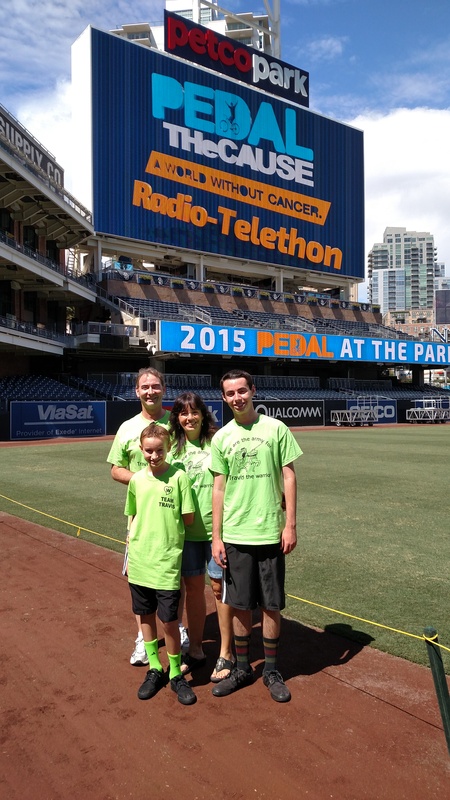 So, Travis decided on Make-A-Wish San Diego! Jonno’s idea was that on October 26th, 2014, he would run a 50k Trail Run and the money he could raise from people sponsoring him would go to this great organization (yes, that is 50 kilometers or 31 miles). If he can reach his goal of raising $8,000, Make-A-Wish San Diego will dedicate a child’s wish in honor of Travis the Warrior. Travis asked: “Coach Jonno is really going to do all that for me?” Wow! What else can we say? Jonno is such an inspiration and we are in awe that he would go through such a grueling training program and a 50k race is such a special way to honor Travis (keep in mind, many of his training runs will be half and full marathons). Here is the link to Jonno’s website with a little about his story. There is also a picture of Jonno and Travis, both sporting their Travis the Warrior t-shirts. Hopefully we can help Jonno reach or exceed his goal to make a child’s special wish come true. Donation amounts of any size will help. Once again, our Faith & Works group has arranged for all of us to participate in the American Cancer Society’s “Relay for Life” which we will do in Encinitas this year. The idea is that we will participate in a 24 hour relay where our team will have someone, or multiple people, walking on the track continuously for the 24 hour period. The plan is that we will set up our campsite and stay from 9am on Saturday, 8/23, to 9am on Sunday, 8/24. Our team will be helping to raise money for the American Cancer Society and cancer research by having a Bake Sale, running some activities during the event and then through the Luminaries that will be lighted at the Luminary Ceremony on Saturday evening. It is going to be a lot of fun and a great way for all of us to pull together to support all of those battling or who have been touched by cancer in some way. Thanks to our cousin, Jeannette, and the rest of the Wagner family (Bill, Sierra, Paige, and Ashley), for your support of Travis and our family. In addition to having a card writing campaign to Travis with a lot her close friends (Travis loves getting and reading all of the cards by the way), Jeannette and her family have decided to host a “Travis the Warrior 5K” Walk/Run event in his honor. You all are so Amazing!!! The festivities will be held in Washington, Iowa on Saturday, October 26, 2013 starting at 8am if you happen to be in the area. They have created T-shirts that say: “We are the Army for Travis the Warrior.” So cool! We wish we could be there but Travis will be doing his 5th round of chemo that weekend so we will have to be there with you all in spirit and maybe by a video clip. Here is the link to their Facebook page for the event. We can’t seem to say this enough but we have been so blessed by the outpouring of support from family, friends and even people we did not know before. Thank you all so very much! In honor of Travis, friends of ours are participating in the Together4Hope Walk which benefits City of Hope whose goal is to CURE CANCER. Both Cheyanne and Kathy will be doing the 2 Day 40 mile walk while Shannon and her family (Jonathon, Spenser, Reed and Collyn) will be doing the 5K walk. Tyler is going to walk with Shannon and the crew on Saturday so it should be a fun event. Everyone will be sporting their lime-green Travis the Warrior t-shirts (thanks to Aunt Karen) and Travis the Warrior buttons (thanks to Kathy) so they should be easily visible if you are in the area to root them on. ;o) Thank you all for supporting Travis in such a special way…Go Team Travis! 8:00 am – Please locate the Pre-registration tent to check-in and pick up your bib. The bib has a tear away ticket that can be redeemed for one event tee shirt. 8:20 am- Help us send off our inspirational 2 day 40 mile walkers. Stretch it out and warm up with Pacific Cancer Fitness. As we mentioned back in early May, our Faith and Works group has arranged for all of us to participate in the American Cancer Society’s “Relay for Life” in Carlsbad. The idea is that we will participate in a 24 hour relay where our team will have someone, or multiple people, walking on the track continuously for the 24 hour period. The plan is that we will set up our campsite and stay from 9am on Saturday, 7/27, to 9am on Sunday, 7/28. Our team will be helping to raise money for the American Cancer Society and cancer research by having a Bake Sale and running a Carnival Game during the event and then through the Luminaries that will be lighted at the Luminary Ceremony on Saturday evening. It is going to be a lot of fun and a great way for all of us to pull together to support Travis and all of those battling or who have been touched by cancer in some way.